India may have crossed many milestones on its way to arresting infant mortality rates, but there is still a long way to go. While the reasons may be many and varied, neonatal hypothermia is known to affect about one-third of children in India. “Children born with low birth weight – those under 2.5 kg – have too much skin and too little fat to effectively keep heat within the body,” says Ratul Narain, co-founder of healthcare-focussed social enterprise, Bempu. “So they spend a lot of calories just keeping their body temperature up, thereby not gaining weight and becoming susceptible to infection,” he adds. 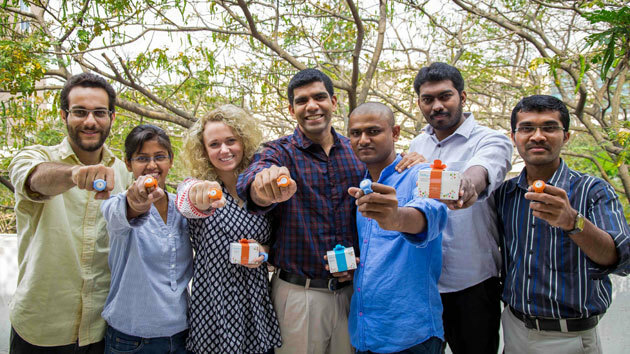 His five-year-old company – aided by a string of grants from the US – has developed a unique solution to this prevailing problem – a simple bracelet! According to Narain, hypothermia in infants can easily be managed through routine measurement of temperature which happens as a standard in healthcare facilities. But in India, especially with understaffed facilities, that is not the case. “In India, the protocol for a newborn is that when they get to about 1.5 kg, they are considered healthy and discharged,” says Narain. “That is still well under the appropriate weight for their age, but that is the standard of care here,” he adds. Moreover, according to him, babies’ temperature should ideally be under 36.5 degree celsius. If it falls below that, parents have to provide what is called a kangaroo mother care. “It is a WHO-endorsed practise where the mother/father/caregiver holds the baby to their chest, binds them with a cloth and then heat transferred through their skin to the baby’s skin actually brings that temperature right back up,” he says. This practise – which can be done anywhere including at home – has been proven to improve the health of newborns, and is possibly even more effective than incubators. But what happens once the baby is taken home is that parents are not monitoring that temperature and will not know when the baby might become hypothermic. This is where Bempu’s TempWatch comes in handy. A bracelet meant for infants, it monitors their temperature whereby parents get alerted with an audio-visual alarm when their baby gets dangerously cold. Priced at Rs 2,499 a piece, it is made from medical grade silicon rubber and is designed to be a constant continuous monitor. “Once activated, it will work 24 hours a day, round the clock for 30 days,” says Narain. “Although not rechargeable, it is an effective solution to a problem that is more common than we would care to admit,” he adds. How does it work? The TempWatch has a device running below its band that constantly takes temperature readings. If it finds a reading that is below 36.5 consistently for several different readings, it will send an alert. However, it does not measure fever since that cannot accurately be detected at the wrist. Raised in Maryland in the US, Narain travelled to a lot of developing countries with his father who worked for the World Bank. During these travels, he had the opportunity to see different health systems and was shocked at the disparities between the US system and the ones that he saw abroad. After graduating with an engineering degree from Stanford, he worked in the US for a few years with Johnson & Johnson, but had a strong desire to get back to India, which he did. He then took a year off to do some field research to understand why India has such a high rate of newborn mortality despite a wealth of resources. “During that time, I spoke with different doctors and healthcare specialists across the country – both rural and urban,” says Narain. “Eventually, I recruited a team of about five or six engineers and a product designer, and together we came up with the concept for a hypothermia bracelet,” he adds. Thus, conceptualized in 2014 and officially commercialized on the market a year later, Bempu has been able to reach 13,000 babies, with more coming up in the next few months. “We have had an overwhelmingly positive feedback on the device because it is so simple. We are also looking at different models for reusablity for different lengths of time, depending on the feedback from customers,” says Narain. “This is our first commercialized product, but we also have a pipeline of other innovations coming up within the portfolio that are currently undergoing clinical validation,” he adds. And although Bempu’s TempWatch may have been awarded one of the best innovations of 2017 from Time magazine, it would not have been possible without its share of challenges. “Building a team is tough. But more importantly, as a social enterprise marketing such a novel concept, it sometimes becomes difficult to reach the people we are targeting to generate impact,” says Narain. “But we have been lucky to have the support of a string of funding agencies, including Grand Challenges Canada, USAID, Norad, KOICA, Bill and Melinda Gates Foundation, Seimens Foundation and Villgro,” he adds. In addition to making the device available for lower income communities, approaching the government can also come with its own set of challenges. “In terms of the budgeting, they require a ton of evidence even to conduct a pilot. They have their own due diligence processes that they need to be going through to screen these innovations before spending tax payer’s money on them,” says Narain. “But we hope that they find the benefit of the bracelet through some of the upcoming studies that are being conducted on the bracelet and then they would be willing to move forward. Moreover, the Govt of India has in recent times prioritised innovation .. In addition to launching their new line of products next year, Bempu is also actively looking at scaling its bracelet across the world, with pilots going on in three different countries in partnership with Unicef.